Sixty-nine million more children under the age of five will have died from mostly preventable causes, 167 million will live in poverty and 750 million more women will have married as children by the year 2030 if current trends continue. Such are the projections of UNICEF's annual State of the World's Children flagship report. Released today, the report paints what the UN child-focused agency says is a "stark picture" of what's in store for the world's children if their needs are not prioritised ahead of the 2030 deadline of the Sustainable Development Goals. 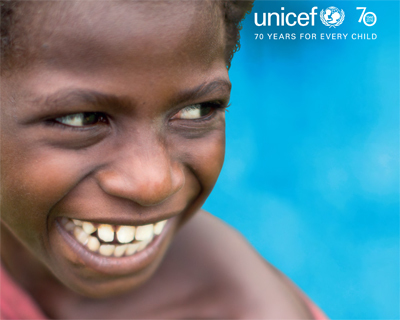 From the cover of the UNICEF State of the World's Children report. UNICEF Australia's CEO Adrian Graham has called on whichever party wins government at this Saturday's election to prioritise reversing the trend of "growing child inequality" both in this country and overseas. Speaking as the global organisation released its annual State of the World's Children report, Mr Graham said the report shows that "business as usual" will not produce results for the world's most disadvantaged children. He said that as the gap widens between the richest and poorest children in countries all around the world, including in Australia, "investing in the most disadvantaged is the right thing to do and it will ensure that every child has a fair chance to survive and thrive". Citing data which shows one in six children in Australia live in poverty and that some children in the country are lagging "too far behind" in health and education, Mr Graham said the "newly elected government must place equity at the heart of our agenda for children". UNICEF Australia's five priorities for the newly elected Australian Government include reversing the trend of growing inequality among children in Australia with a particular focus on poverty, health and education, ensuring a fair start for Aboriginal and Torres Strait Islander children, and rebuilding Australia's aid program with targeted support towards the most disadvantaged children in the Asia-Pacific region. They are also calling for the new government to demonstrate an action plan to ensure refugees on Nauru and Manus Island, including children and families, have a viable, permanent resettlement plan that enables them to rebuild their lives, and, to work with civil society to put Australian on track to meeting the targets of the Sustainable Development Goals. The report shows that while significant progress has been made in saving children's lives, getting them into school and lifting them out of poverty in the past couple of decades, the progress has not been even nor fair. Data shows the world's poorest children are twice as likely to die before their fifth birthday and twice as likely to be chronically malnourished than the richest. Across much of south Asia and sub-Saharan Africa, meanwhile, children who are born to uneducated mothers are still almost three times more likely to die before they are five-years-old than those born to mothers with a secondary education. Anthony Lake, UNICEF's executive director, says that the world has a choice: to invest in children now or "allow our world to become still more unequal and divided". "Denying hundreds of millions of children a fair chance in life does more than threaten their futures - by fuelling inter-generational cycles of disadvantage, it imperils the future of their societies." In a forward to the report, Mr Lake says that changing the future of these children is a matter of political commitment, of resources and of collective will. "We have an opportunity to replace vicious cycles with virtuous cycles in which today's poor children - if given a fair chance at health, education, and protection from harm - can, as adults, compete on a more level playing field with children from wealthier backgrounds. Thus making not only their own lives better, but their societies richer in every sense of the word." Sub-Saharan Africa, where two out of three or at least 247 million children already live in "multi-dimensional poverty", is one of the areas in the world where action is most needed. The report shows that following trends of the past 15 years, the region will account for nine out of 10 of the world's children living in extreme poverty by 2030. It will also have been home to almost half of the 69 million children projected to die before the age of five over the next 15 years from mostly preventable causes at a rate 10 times that of children in high-income countries. And in 2030, sub-Saharan Africa will account for more than half of the 60 million children of primary school age projected to not be in school. Other findings in the report show that under current trends the global maternal mortality rate is set to be at 161 deaths per 100,000 live births - a level which is five times that of high income countries as far back as 1990. Pneumonia will remain the second biggest killer of children under five-years-old with pre-term birth complications the first. As many as 38 per cent of children, meanwhile, currently leave primary school without learning how to read, write and do simple arithmetic.